Whether you're young or young at heart, a fairy garden is a delight to see. And in Altoona, there are some creative, clever and hard workers who have created one of the most extensive fairy gardens I've seen! 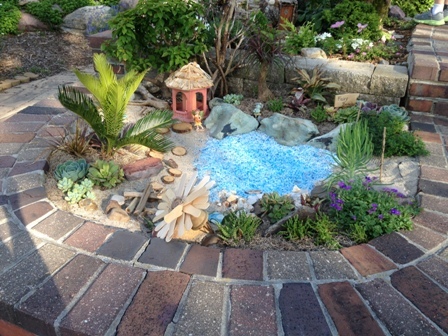 The fairy garden includes a beach scene, farm scene and woodland scene to name a bit of it. There are always children with pure joy on their faces studying the fairy gardens each time i visit. Logs, popsicle sticks and more craft the tiniest items for the little fairies. These gardens are located among the Enabling Gardens of Altoona, located behind the HyVee. The Polk County Master Gardeners plant and maintain this beautiful area. A pond is located adjacent to the gardens making it a great location for an evening stroll. Be sure to add this to your places to visit this summer!